In December last year, the airspace surrounding Gatwick Airport was closed for more than 24 hours after drones were spotted flying over the runway. Hundreds of flights were cancelled and the Christmas plans of tens of thousands of passengers were ruined. Sadly it wasn’t an isolated incident. Barely a week goes by without the media reporting on a near-miss drone incident. In 2017, the UK Airprox Board, which tracks near misses involving commercial aircraft, recorded 92 near-miss cases involving drones and aircraft – in 2015, just 29 incidents were recorded. It’s not just hobbyists who are falling foul of the law. Companies and organisations that are increasingly relying on drones fitted with cameras to help them conduct their day-to-day business are also wreaking havoc. Sometimes it’s because they lack appropriate training to fly the drones and/or they are unaware of the regulations. And sometimes they fall foul because they have bought a device that is ill-equipped for how they want to use it. So what do organisations looking to buy a drone need to consider to ensure they get the right product for the job in hand, and what are the common mistakes people typically make when procuring drones for the first time? One of the reasons the number of recorded near-miss incidents has risen so rapidly in the UK over the past few years is because of the sheer number of drones that are in operation. It is impossible to put an accurate figure on how many small hobbyist drones are being used, but according to figures from the Civil Aviation Authority (CAA), which is responsible for the regulation of aviation safety in the UK and determining policy for the use of airspace, including the use of drones, in August last year there were 4,530 operators with permission to use drones for commercial operations in the UK (in 2010 there were just five commercial permissions). These commercial services vary wildly. At one end of the spectrum you have professional surveyors and construction companies using them for property development projects, and companies such as Athonet trialling the use of drones with a full on-board LTE network to provide coverage in remote locations. At the opposite end are wedding photographers offering aerial footage of the big day. Given the diversity of uses coupled with the vast array of different drone products, it can be tricky for businesses or organisations navigating the minefield of procuring a drone for the first time. Some may not even have to go through the expense of buying a drone for their own use – they could get away with working with a service provider, according to Francois Gervaix, geospatial project manager at senseFly, the commercial drone subsidiary of Parrot Group. If the drone is intended to be deployed at a greater frequency than Gervaix’s suggested 15-mission limit, it probably does make sense to take the plunge and buy one. After establishing that is the case, the next step is working out exactly how the drone will be used in the field. This in turn will help organisations identify the product that best matches their needs. For instance, Gervaix says the “median size of the area [that needs to be covered by the drone] will determine the type of drone, quadcopter or fixed-wing”. Another important consideration is the ‘detail’ users want to inspect using the drone, according to Tobias Wentzler, enterprise business development manager EMEA at drone manufacturer DJI. Big versus smallA further determining factor is budget, which is particularly pertinent for the emergency services (see case study). Wentzler says there are products available to suit all budgets, with a potential option for those with limited resources to take slightly older models, which are typically cheaper. Those on a restricted budget could also consider investing in some of the higher-end consumer devices, says Jonathan Nicholson, assistant director in the CAA’s communications department. Purchasers also need to be aware that the price of the drone is only a small percentage of the total outlay to establish a drone programme. “Only considering the drone and not including training or maintenance is one of the common mistakes that many first-time commercial drone-buyers make,” says Gervaix. There is also the cost of any supporting software and the cost of training, licensing and insurance, which can easily run to a few thousand pounds. When you start to factor these additional elements into the equation, the costs start to add up, but it is vital that organisations tick all of these boxes, says Nicholson. Any good training programme will also cover the regulatory landscape to ensure the user doesn’t endanger members of the public or other airspace users. These regulations include not flying a drone within 1km (soon rising to 5km) of an airport and not higher than 400ft – there are special exemptions from the CAA’s regulations for blue-light services, according to Nicholson. However, as this is still a fairly nascent sector, commercial drone users need to ensure they keep up to date with the regulations, which are rapidly changing as usage evolves. To reflect these changes in usage, in 2018 the government consulted with members of the drone industry and representative bodies such as the CAA on proposals for a new drone bill. Its response (https://bit.ly/2VCgNeB) was published and it states that from 30 November 2019, it will be a legal requirement for all drone operators to register, and drone pilots to complete an online pilot competency test. The response also said that the government is finalising a Draft Drones Bill to give the police the power to request evidence from drone users where there is reasonable suspicion of an offence being committed and to issue fixed penalty notices for minor drone offences. Another regulatory change that is expected to come into force shortly and which could have more widespread repercussions is a set of rules governing the use of drones across all European airspace. Historically the European Aviation Safety Agency (EASA) hasn’t covered drones – regulations have been set at a national level, and these vary wildly across Europe, with some countries operating very restrictive rules on drone use and some having hardly any. But that will all change sometime in early 2019 when EASA publishes regulations governing drone use that will come into force over the next 12 months or so. As to whether this is relevant, given Brexit – according to a speech given by the CAA’s chief executive, Andrew Haines, last September, the organisation is “very explicit that we want to remain full members of EASA”. The CAA has played a key role in helping to draw up the regulations, and Nicholson says the agency wholeheartedly supports the plans because a lot of people travel overseas with their drone, so having one set of rules for the whole of Europe is sensible. As well as providing clarity and promoting safety across Europe, having a uniform set of rules that give greater enforcement powers to the police might help to put an end to incidents like the one at Gatwick Airport late last year. 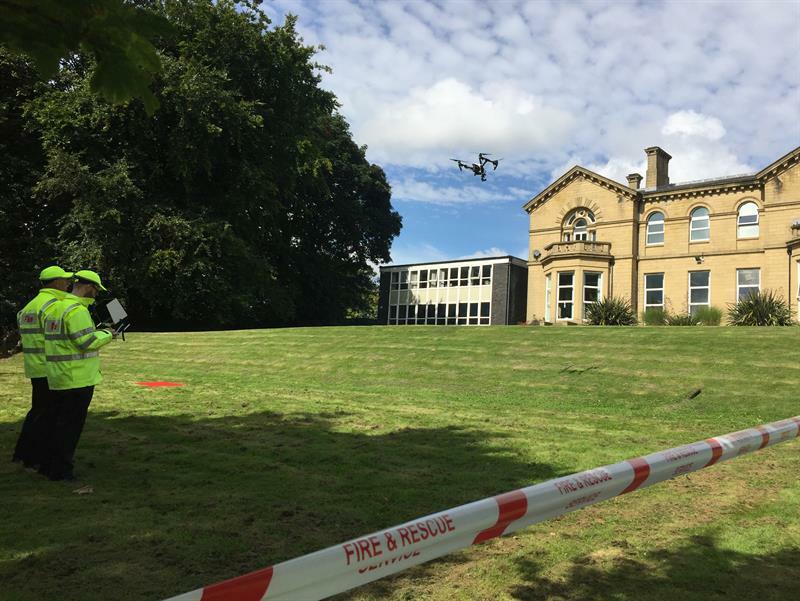 West Yorkshire Fire & Rescue Service invested in its first drone in June 2017, but didn’t start using it in live operations until January 2018 after spending months practising flying the device. “We wanted to make sure we got everybody up to speed and had plenty of practice using it as well as putting in place all of the operational background stuff that people needed to know before going live and turning up to incidents with it,” explains Stuart Wilson MBE, chief drone pilot at the service. Since roll-out, the drone has been used by the service on numerous occasions for internal purposes, such as roof inspections of fire brigade property and filming trainee passing-out parades.